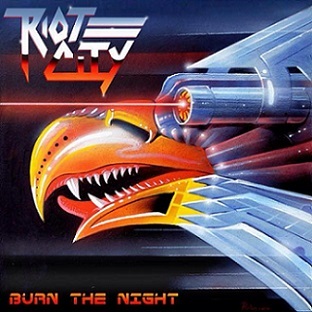 RIOT CITY from Calgary, Alberta, Canada, is one of those young bands that represent the new face of Canadian metal. Their debut album “Burn The Night” is an amalgam of ripping and hot heavy metal, created in pure and youthful madness. Formed in 2011, RIOT CITY released the “Livin’ Fast” demo in 2014 and the eyes of the underground metal world were open wide to watch and follow this new and promising band. I personally came in touch with their music through the “Masters Of Metal vol.1” four-way split / compilation CD that was released by Divebomb Records back in 2016, including complete demos and/or extended play releases by four bands: CRYPT SERMON from Philadelphia, PA, RIOT CITY from Alberta, CAN, HELLRAZOR from Raleigh, NC and OLD WOLF from Somerset, KY. I was quite excited listening the fast, ground breaking Metal of those Canadian newcomers. I actually put the band on a corner in my mind, returning to their stuff from time to time and following each of their new song upload on their youtube chanel. But the truth is that I was not prepared at all for what followed all those demo recordings. 1. It includes eight, great compositions of fast pieced Heavy Metal with some Speed Metal touches hear and there. Yes great songs, featuring interludes or storm-taking intro riffs, featuring complete and well composed vocal phrases, based on catchy vocal melodies. Featuring amazing and well played lead guitar parts. I will have to add in here a little reference to Cale Savy’s vocal range. The man really screams his guts out. And this is a big plus for the overall result. 2. Their songwritting is extremely well arranged and into the point. No filler songs in the album, no filler parts in the songs. Just eight Heavy Metal anthems and an album that is meant to be heard from start to finish non stop. Yes like the good old days where the albums were including eight songs and we were learning the entire tracklist on its correct order just because we were listening the album countless time. 4. The album’s production is ideal. Loud, heavy, shining and crystal clear. It is actually the kind of production that does justice to the music and lets the songs to be listened even louder. EVEN LOUDER. You may ask me for their influences. Well, I would consider JUDAS PRIEST, AGENT STEEL and HELSTAR to be some key influences for this amazing Canadian Metal force. So. If Heavy Metal music is your main focus, then this record is a must. Why? Because it contains first class and amazingly performed steel, played from the heart. It seems that No Remorse Records keeps on bringing to the foreground some amazing newcomers. Last year we got their amazing MANACLE release. Now its the year of RIOT CITY. Go and get a pair of new speakers. You going to need it. Want to hear one more track from this great album? Click on the link bellow. Reborn In Steel show on Mercury Radio, premieres one more RIOT CITY tune (8:52).